Steve Humble MBE works at Newcastle University, UK. He was the Senior Regional Coordinator for the National Centre for Excellence in the Teaching of Mathematics (NCETM). His research focuses on talented children in low-income areas of Dar Es Salaam, Tanzania and their possible contribution to the eradication of poverty. He is a Member of the European Mathematical Society (EMS) Committee for Raising the Public Awareness of Mathematics in Europe, a fellow of The Institute of Mathematics and its Applications (IMA) and delivers "Maths Master Classes" for the Royal Institution. To promote public interest in mathematics he wrote fortnightly newspaper columns for eight years as ‘DrMaths’. He also has written a range of puzzles ‘explorer’ books and a number of classroom resources. Humble's new book "How to be Inventive when teaching Primary Maths" has just been published by Routledge (2015) and was Routledge education author of the month March 2015. 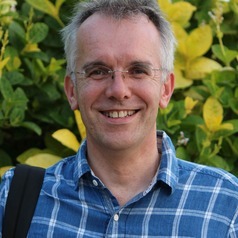 He is editor with Dixon on the "Handbook of International Development and Education" (2015) and editor for "50 Visions of Mathematics" (2014) from OUP. Humble was the Director of the British "Numbers Festival" at Newcastle University, which took place in the summer 2015.